Yes, but they ease into it. They may go camping with a parent, or even with the entire family. More on Cub Scout camping can be found at the Cub Scout Outdoor Program. The annual Pack 223 dues of $75 covers such items as the National registration fee, Boys' Life Magazine, the neckerchief and handbook appropriate for your son's rank, the raingutter regatta and pinewood derby kits, and all patches and awards for the year. Other costs include uniforms and some activity fees including those for the Day Camp and Resident Camps. Youth members participate in a variety of fund-raising activities, such as popcorn and candy sales, which help to cover Den supplies, equipment, and other activities. 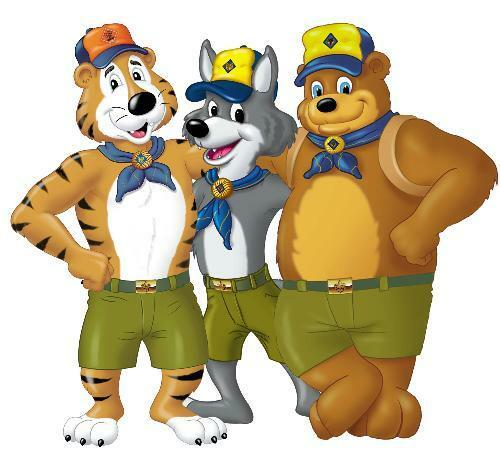 Cub Scouts usually meet in their Dens once or twice each month, and a Pack meeting is held for all Cub Scouts and their families once a month. Beyond that, it depends on the Den and Pack: a Den may hold a special activity, such as a service project or visit to a local museum in place of one of the weekly meetings or in addition to the weekly meetings. Likewise, the Pack may conduct a special event such as a picnic, campout, or service activity as an additional event, rather than a substitute for its monthly Pack meeting.